So, I was planning to do part 2 of my “year in two posts” over the weekend but I fell sick. It was sudden and horrid, a very bad cold (or the flu, I’m not sure). I had razor blades in my throat, my nose blocked up completely when I lay down so I couldn’t breathe, so I had to pass the night sitting on the sofa, I had to run to the toilet every 15 minutes to blow my nose and pee, and my stomach was full of gas due to overzealous salivary glands causing me to swallow constantly, which then provoked the razor blades in the throat more, which in turn provoked the salivary glands, ad infinitum, and life is miserable. Lemsip was rubbish. Didn’t do a thing at all. It did work for me in the past, when I was in Singapore, but it never seems to in England, and I’ve tried enough times to be sure, since I was getting colds (or the flu) about once a month last year while I was working with children. It was only after a day and night of suffering that I suddenly remembered this crazy miracle cure I had once in China: Boiled ginger coke. I got to boiling. It was a happy chance that I just happened to have ginger and Coca Cola at home. I also added some lemon juice because some online recipes mention adding lemon slices. I thought it would improve the taste. I think it did. I drank one can that night but I don’t think I used enough ginger because the drink didn’t wow me like it did when I was in China. The next day, I doubled the ginger dosage and left it to simmer a bit longer, and immediately felt better after drinking it all up. I took another dose in the night just before bed and slept quite well. I woke up feeling very optimistic. Almost all the pain and discomfort had gone. The only annoying thing left was a runny nose but runny noses are not painful so I was quite happy with that. While I was on my ginger coke treatment and feeling rather disappointed with Lemsip, I asked Piers to get me more Lemsip because we were running low, and just in case I needed more. I know, I know, it sounds crazy to continue putting your faith in something that has failed you repeatedly, but when you’re ill and desperate, something (even bought hope) is better than nothing. I was sleeping when Piers came home with the pills, but it was Beechams and not Lemsip. He said the store didn’t have Lemsip. They had two types of Beechams and he got the Ultra, which was three times more expensive. I woke up, still lying there, smiling to see him. He explained the change of brands and his decision to buy the more expensive one (“Must be more effective, right?”). I was impressed. That sounded special. I read that out loud and looked at him expectantly. 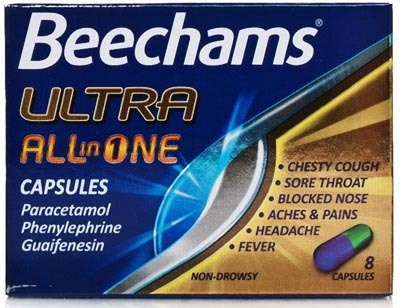 And, by the way, Beechams Ultra is really good. Stopped my nose running. I’m not 100% yet but it’s getting there, so we’re back in business. Part 2 coming soon! Know someone who'd enjoy this post? Share it! Hi, I'm Sheylara. I don't know. Just... read my blog, you know? I'm tired of pimping my profile so this is all! Thank you!